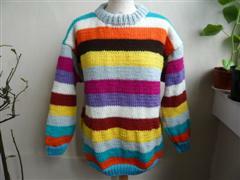 Jumpers..chunky, mohair, long sleeve, short sleeve, tank tops, aran, round neck, v neck, striped, plain…phew the list is endless. K is for knitting….what else? Original..how many people can you count who can hand knit a jumper or cardigan ???? Unique… your hand knits cannot be bought in any main stream shops…why be seen in something everyone is seen in..be unique…people will ask you ‘where did you get that jumper’ ?? Wear with pride..all your own work good eh ! Xmas..what an great present to give..not to be found in any fashion chain shop, your family and friends will be so pleased with such an original gift of hand knitted jumper, cardigan scarf or even socks for the special man/woman in your life! Z.zzzzzzzz so relaxing you can sometimes nod off………….